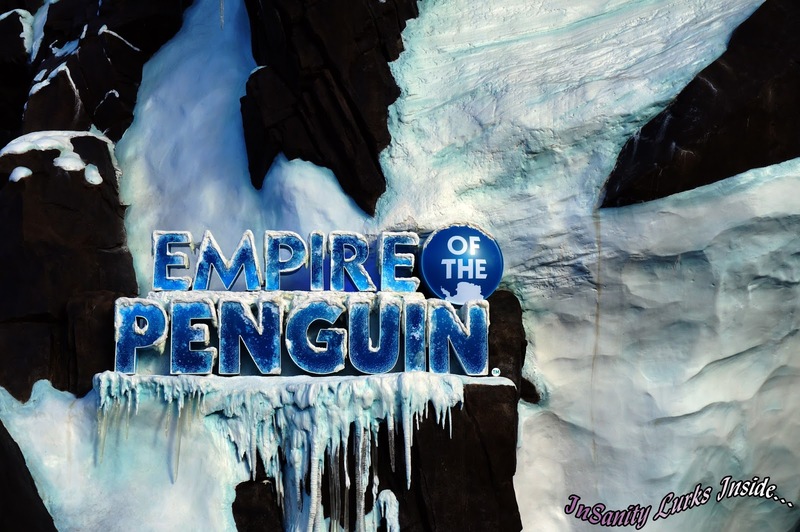 Antarctica: Empire of the Penguin is the newest attraction at Seaworld Orlando. It opened just this year on May 24th, 2013 to record crowds. The Penguins at the park had always been a fan favorite and many awaited anxiously to find out what would replace them. While other zoos across this country may boast about having a few penguins- No one really had the habitat size, breeding success or number of species that Seaworld Parks boast. So when the Orlando park decided to change their penguins, people got a little worried. While Seaworld Orlando has never really 'removed' anything animal related, only changed themes, people feared the penguins would no longer have their own dedicated area within the park. However, once construction pictures begin and the park spilled the beans about the project, people rejoiced. Well, Some of us did. 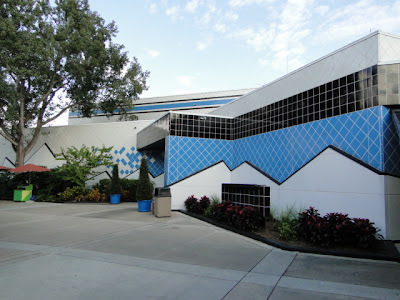 Others wondered what would happen as the original "Penguin Encounter" building held lots of memories. From Girl Scouts, Employees and even tourists who simply stumbled inside to get a break from the heat- this building was a massive landmark. Some of us even called this building "Home". Myself included, I can still smell it. A combination of wet carpet, bird poop and fish. I can hear the music playing in the back of my skull with it's highly peppy tune that made you want to waddle along and follow it, like some kind of flightless penguin pied piper. It featured an 'up close' area with a 'people mover' belt in front and a huge viewing gallery just before that. In my opinion, the best part came second and was often overlooked- the smaller area which held the Puffins. This area was off the belt tucked back in the building and rarely ever crowded. Another little known fact- this was one of the most secure buildings in the park. Very thick, reenforced concrete built to stand up to hurricanes and the Florida heat- it was the main home of "Hurricane Ride-Out" teams. Seaworld never really had rides, as you would think of them in the traditional sense. All that began to change around the 1990's when Mission: Bermuda Triangle opened as the parks first 'big ride'. Later replaced with 'Wild Arctic' in 1995, the next big step came in 1999 with Journey to Atlantis- a water coaster. The park began to mix Big Ticket Attractions with their animals, not only to keep people coming to the park but to add in something for the folks who wanted thrills with their edutainment. After years of adding in new attractions and re-furbishing older ones with new themed and updates, the park turned their eyes to the Penguins. The 'Penguin Plaza' as it was once known got a massive overhaul, a ride and a new 'up close' penguin encounter area. The gift shop and snack area as well as the attraction all got a one way ticket to be transported to the Antarctic. Everything was re-finished with snow, ice and mountains. Giving folks a feel for what the antarctic looks like. Rocks and Snow bulge out of the Florida sand, making you wonder for a moment just where you ended up. It's beautifully done with plenty of little hidden gems lurking around inside, look around the area. 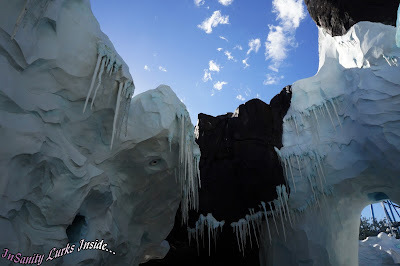 If your careful, you'll spot penguin carvings and even a penguin shaped area new the entrance. They transformed a stocky, imposing building into something akin to a work of theme park art. No detail is left unfinished. Your queue line is both outdoors and indoors. You'll wind your way through glacial nooks and around rocky outcroppings. Randomly getting blasts of icy cold air coming from inside the building. However, let me warn you. If you plan to spend any good length of time inside, bring something WARM to wear! Penguins like cold and I do mean COLD. Inside it kept at an icy 30 degrees. While for several minutes it does feel lovely compared to the often high heat of Orlando, you'll be shivering moments later. You step into a Cave that's icy cold and windy, the air is blowing all around you quickly giving you chills. Moving through sculpted passages you finally enter a pre-show area. Featuring various screens you see scenes of the Antarctic and get introduced to a Gentoo penguin family and shortly, your storyteller- Puck the Penguin. It's Puck you'll follow at this point, learning and exploring with him. From this pre-show you next move into a queue line where you get to join Puck on his first big swim in the ocean. You can chose two versions of the ride- Mild or Wild. The major difference is how much tilting and spinning your trackless vehicle will do. We chose 'mild' as we had a friend who isn't big on wild rides and her wee monster with us and she's a bit of a chicken (don't worry, we're trying to fix that in the wee monster! Mama is pretty hopeless- but that's a story for another time). Once on your ride, you'll travel through various scenes all showing our hero Puck and his adventures. 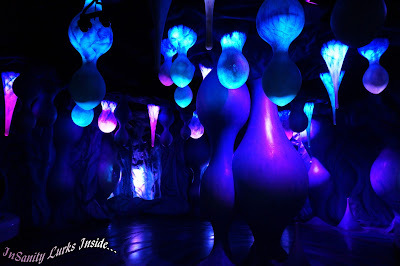 You'll slip and slide around a crystal cave, moving through the area in what seems like random patterns of a penguin at play. Each scene is visually beautiful as you can see from the picture to the right. Through screens you'll keep following your penguin guide deeper into trouble. Finally you'll reach a large screen where you dip and turn, being chased with Puck by a leopard seal. This is major difference in the rides, the 'wild' side has a LOT more movement then the 'mild' size does at this scene. 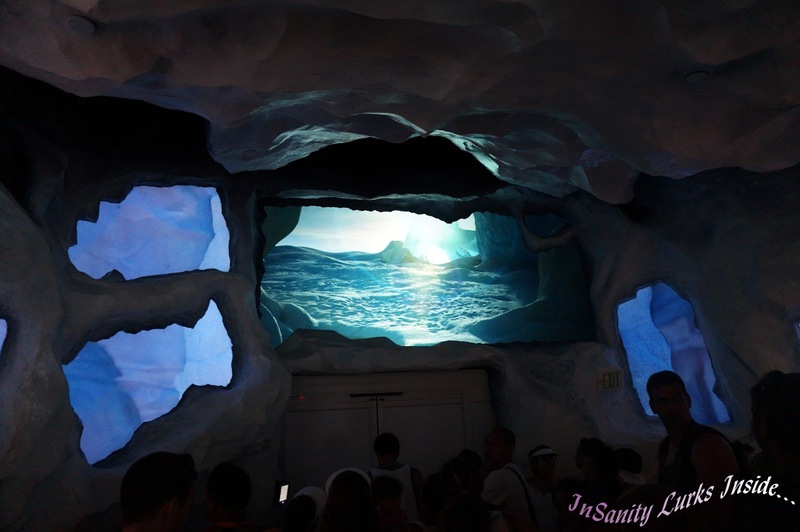 Naturally you'll escape and your ride vehicle will park and you exit into the massive new penguin viewing area. Inside you'll come as close to penguins as possible. They swim in an open air but indoor environment that your now a part of. There isn't much of a barrier between you and these flightless critters, you can view them without glass in your way. This exhibit is massive, twisting in various directions in what seems like an endless area of penguin crazy. It's simply a beautiful, huge area filled with a reported 245 live penguins of various species. 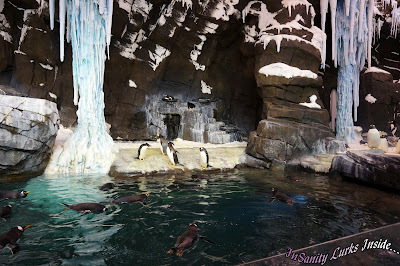 Featured here you'll find King Penguins, Gentoo Penguins, Rockhopper Penguins and Adelie Penguins all living together. Giving you the full illusion that your in the Antarctic and could reach out and touch the animals. However, I wouldn't suggest it as they are carefully guarded by employees. Those same employees are full of knowledge about these penguins and are happy to share. Ask them questions- they probably know the answers or they'll find out the information your looking for. One could easily spend as much time as they like inside, your not rushed through anything here. It's more a matter of how long you can tolerate the icy cold temperatures inside. You'll probably notice an oder at this point- Penguins are rather stinky birds. 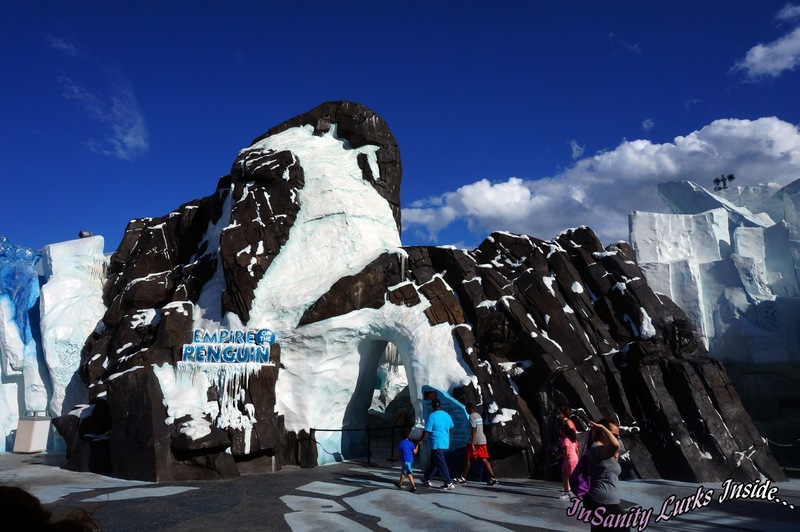 To keep the environment clean for both birds and guests Seaworld replaces the nearly 20,000 pounds of snow each day and cleans the exhibit multiple times per day. 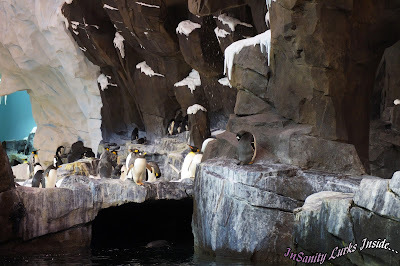 Once you pass the open viewing area you can head downstairs and view a huge underwater area, watching the penguins swim and chase through their new and improved area. Overall the new "Antarctic: Empire of the Penguin" is a beautiful addition to an already lovely park. 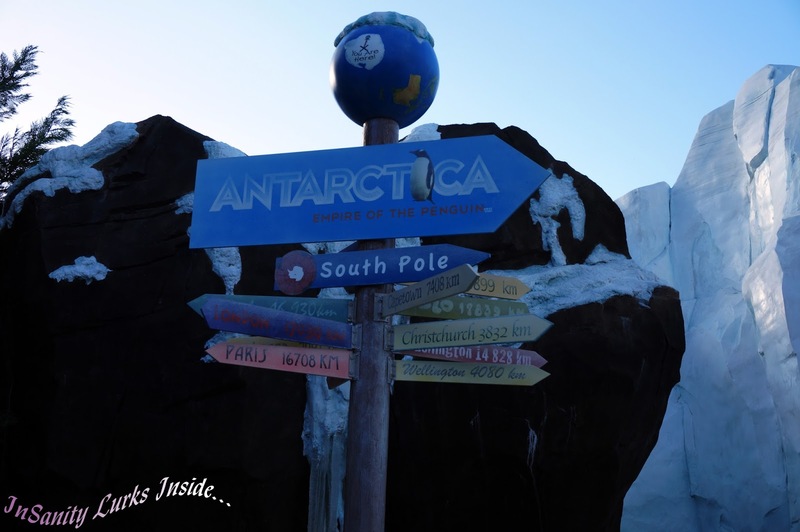 Both amazingly themed and visually striking, the park has gone above and beyond not only giving their penguins a new home. They've given the public a way to view and learn about these animals in a way that's both fun and entertaining. I've said it before and I'll say it again. I support what Seaworld is doing, both the education and conservation programs they have in place do great works. I don't always agree with their methods but I fully believe their heart is in the right place.